MELISMATIC: HEAR THIS: Who is Jesse J? HEAR THIS: Who is Jesse J? 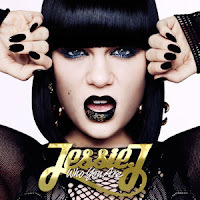 I have created in draft and deleted no fewer than six different posts regarding the musical conundrum to me that is Jessica Cornish, better known as Jessie J. After fully digesting her US debut album, the at-times-brilliant Who You Are, my mind has been made up. I am indeed a fan, but there have been times on and off since she first broke out on the hype scene with "Do It Like A Dude" when I doubted this fact. I do wish I could truthfully nail down exactly who Jessie is, not just as an artist but as a songwriter. I suppose that's part of her charisma in a way -- she's a bit of a pop chameleon. At times she sounds like a Christina Aguilera protege, wailing away at her melismatic riffs and proving to the audio-obsessed public that she can in fact sing and sing well in a market saturated with poptarts (especially of the female persuasion) far too reliant on Auto-Tune to do the heavy lifting. Sometimes she sounds like a British, Caucasian version of Rihanna (with a stronger, more consistent voice). There is no question there are traces of Katy Perry in her image presentation. In her own way, she's a mixture of all three, with a British accent. Her singles have been on point in terms of catchiness, and much of this is due to the fact that her album's production and writer list reads like a who's who in Pop Production Royalty -- Toby Gad, Claude Kelly and of course, the at times unbeatable Dr. Luke, the latter two being responsible for her breakthrough US hit "Price Tag". Many will argue that with people like that in your corner, almost anyone can sound popilicious...and at times I tend to agree. My main caveat with Jessie J is the omniscient image problem. Obviously this girl can sing, however this tends to take a bit of a backseat to her history as a songwriter. She was part of the crew that brought us Miley Cyrus' huge pop hit "Party in the USA" (and apparently was in talks to use the song as her own first single, but that didn't end up working out). She has also written for Chris Brown and has submitted cuts for Christina Aguilera and Britney Spears. Clearly, she was meant for the pop music game. Maybe this was why when you combined these facts alongside the powerful first single that is "Do It Like A Dude", many people especially in the pop blogosphere started getting powerful Lady Gaga flashbacks in a very good way. "Dude" is one of the biggest (English-language) earworms I've heard from a new artist in a long while (even though at times the main hook sounded kind of sounds like a musical parody of one of MadTV's infamous sketches..."He look-ah like a man"...was that just me?). It's stickiness is damn near undeniable. Just when excitement for Jessie's full project was hitting fever pitch thanks to "Dude" (especially Stateside as too many Brit pop artists get the shaft when it comes to American releases), we (as Americans anyway) get saddled with "Price Tag", her main introduction to the American public complete with a verse by the semi-rapper of the moment (arguably), B.o.B. I've got nothing against him -- I loved "Nothin' On You" and "Airplanes" as much as the next person -- but so much about "Price Tag" rubbed me the wrong way, and a lot of the problem was in the cliched (and at times self-righteous) lyrics. I guess I was just expecting more from Mr. Claude Kelly. Certainly I've heard (and loved) worse. (I mean, it's not like "Party in the USA" got points for being lyrically complex anyway.) But a part of me was hoping for something much punchier from a young woman who got her pop start with something as sassy as "Dude". Her earnest girl-powery brand of songwriting was evident as early as "Dude", and it's something I won't bemoan. We definitely could never have too many examples of strong, confident, powerful females period, let alone in pop music. That being said, given potential and opportunity, I found "Price Tag" to be a little too cliche and preachy even for my taste (although I'm certainly tired of the "video hoes," too). It almost put me off listening to the full record entirely, in fact, but I am glad I did. Who You Are can be labeled as a bit hit and miss (and a few other tracks fall victim to the "Price Tag" type of infliction), perhaps due to the large gamut of different producers that contributed to the project. However, there are several cuts that are diamonds in the rough. Among them: the funky bass-line and piano-driven "Abracadabra" and the tongue-in-cheek, power to the under-dog "Who's Laughing Now" (because who doesn't relate to that idiom at least once in their lives?). For the most part, Who You Are leans on the "Price Tag" side of Jessie rather than "Dude", forgoing more laser-y synth for more organic sound samples (and I'm not complaining about that, no matter how much I love "Dude"). If Jessie J is truly asking "who" she is, then it's the "Nobody's Perfect" Jessie that I want to see more of in the future. "Dude" is a lot of fun and all, but give me a popstar who can make me feel good about being female with vocals that don't quit and hooks that truly hook, and Mel is a very happy camper indeed. If her smattering of releases has left you a bit unsure of where to begin, heed my suggestion and download "Nobody's Perfect". You won't be disappointed. Keep poppin', Jessie.